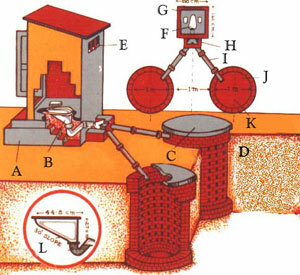 B. PAN, TRAP MASONRY & FOOTRESTS. C. 105 cm DIAMETER AND 6 cm THICK COVER. F. PAN, TRAP & FOOTRESTS. G. BRICK MASONRY (100 cm x 120 cm). H. CONNECTING CHAMBER (20 cm x 20 cm). I. 75 mm DIAMETER PIPE. Dry (Bucket) Latrine is easily converted to this latrine. There is no odour nuisance. It is scientific and Hygienic. There is no need for a scaverger to maintain it clean. It is possible to flush with a small amount of water (1.5 L.) because of the special type of Pan and Trap. Twin leachpits absorbing Urine, Nightsoil & Water of continuous use. The collected and digested Nightsoil is converted into rich manure on extended sorage. One Leachpit serves a family of 5-7 members for about 5 years. The transformed water and gas on digestion of nightsoil are absorbed into the soil. Because of water seal in this latrine it does not give out malodours. This is the most inexpensive type of Latrines. There is no need to provide a gas pipe. There is no possbility of pollution of water in the nearby wells and handpump strata.